Kitesurfing, one of the world’s fastest growing sports is about to hit mainstream popularity in Ecuador. This sport that mixes the enjoyment of wave riding experienced in surfing, the adrenaline pumping high jumps and speed that was once only defined by windsurfing has taken over as a preferred adventure sport by those who love the water. Be it bay, ocean or lake; get ready to see many more kites appearing in the sky. In its 11 year history kitesurfing, also known as kiteboarding, has already lured more riders world wide than wind surfing and is rapidly gaining numbers on its predecessor surfing. Personally coming from a surfing background I never thought the day would come when I could compare the two but as the kitesurfers keep exploring the breaks around the world it is making surfers think twice. Watching kitesurfers carve up wave after wave, riding with ease through barrels, getting air so high there is time to enjoy it, and catching more waves in a session than a surfer might in a week is why some of the world’s best windsurfers have turned to kitesurfing. Names like Robbie Naish and Pete Cabrinha, both world champion wind surfers are now current world leaders in kitesurfing technologies. 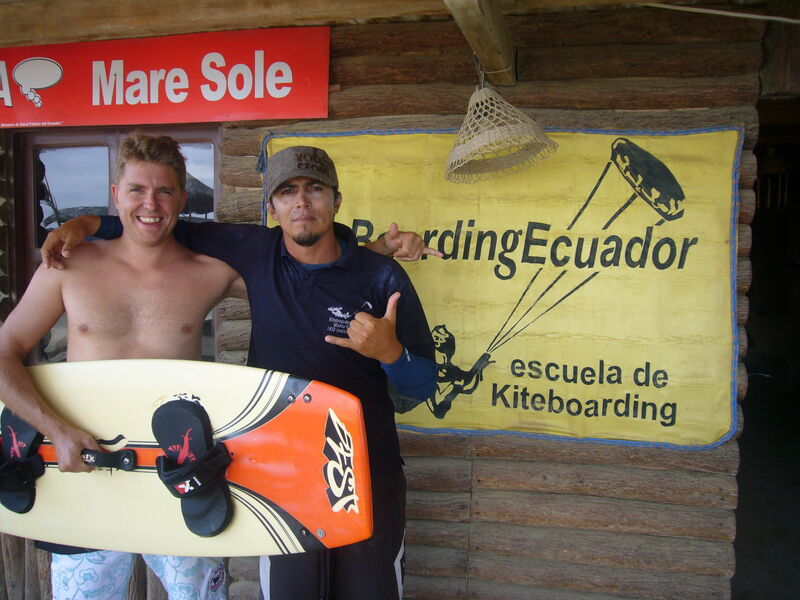 Kite school owner and former Colombian windsurf champion Robert Bedoya introduced kitesurfing to Ecuador in 2004. He remembers, “The first day I saw a kitesurfer in Cartagena (where Robert had a popular windsurf school), the kitesurfer jumped twice as high as I could as a windsurfer; I quickly realized that this was the sport for me.” This was back in 2002 when kites and their accessories were still in early design mode. Since the 1990’s kite technology has evolved rapidly with major improvements each year in kite durability, security features and relaunches capabilities. These changes are have been crucial in the development and growth of the sport. Initially it took experienced surfers or windsurfer’s four to six months to learn basic kite control and the early kites were foil kites, so as soon as they hit the water the rider had to swim to shore. In comparison, now you can spend a week at your local kitesurf school and be up and riding. “This year using the BEST Kahoonas kite my students are learning twice as fast as the year’s before,” explains the South American kitesurfing pioneer. A beginner’s course at the Ecuador Kitesurf School in Manta will take you eight hours, normally with two to three hours a day. They also offer the option of learning Spanish in the mornings and then the kite van picks the students up at midday ready for their afternoon kite lessons. Talk about making the most of a vacation! Manta in the ManabÃ­ province is the home of kitesurfing in Ecuador. On this 20 km stretch of coastline there are two beaches that national and international riders flock to during the wind season, which is May until mid January. Manta exhibits ideal kitesurfing conditions; smooth and safe side on winds, long flat beaches perfect for teaching classes, and not to mention the warm water. This part of Ecuador is off the gringo trail, meaning you can’t help but discover the true essence of an Ecuadorian fishing town. Robert could not believe his luck finding Santa Marianita on a three-month trip scouring the Ecuadorian coast. He left Colombia having heard whispers that Ecuador had wind and wide untouched beaches just waiting to be kited. It was as he drove along the Ruta del Sol he stumbled upon his dream. Driving down the hill towards Santa Marianita, (today the most popular kiting beach in Ecuador) he spotted the infamous white caps that indicate good strong winds, “That was it, what I had been looking for!” Robert says with a big grin. At this time of year you have the chance to kitesurf with the humpback whales that are making their way south. Or even if adventure sports are not your thing kitesurfing is also a striking spectacle to observe, especially combined with passing marine life.